Thanks for the invite John Here is my first post.This is a kit bash form two Railking Banks. My passenger train days were mainly traveling from Minnesota to North Dakota and Minneapolis Union Station was on the Mississippi River. 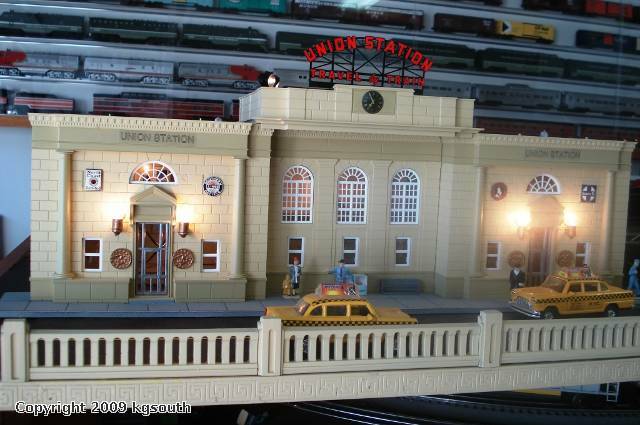 The train shed and tracks were below street level so I tried to duplicate that effect with my Union Station. Only the NP,GN and Burlington Passenger trains used the station but I took liberties to include the Santa Fe and Southern Pacific. 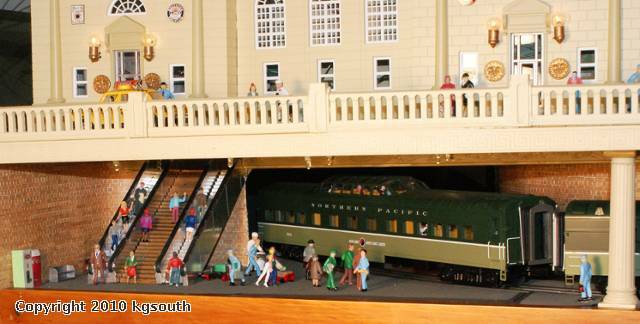 A recent addition is the stairs and escalator. I used the old Atlas stairs to make this and the escalator ends came from a mold made for the train station on the FowlerDreamlayout.com. The stainless steel look is from using silver duct tape. I should have studied this photo more. Every time I look there is something I want to change. Oh well its a on going process If you finish the layout you get kicked out of the club! That's a really terrific job kgsouth. I like the sidewalk and ballusters in front of the station too. Beautiful! I really like how that escalator came out - it's making me want to make one and put it somewhere in my layout. Great job, lots of hard work! I love your station, which I just saw for the first time. I bought two Railking banks at York last month and today I cut them apart with a Dremel tool and cutting wheel. The articles I've seen about kitbashing those banks seem to indicate the four walls just come apart when you cut through the connecting plastic ledge. I must have gotten a later edition of the banks, since I had to surgically separate the walls, which look like they were injection molded in one piece. I love what you did on the roof. What did you use to make that section that includes the clock? 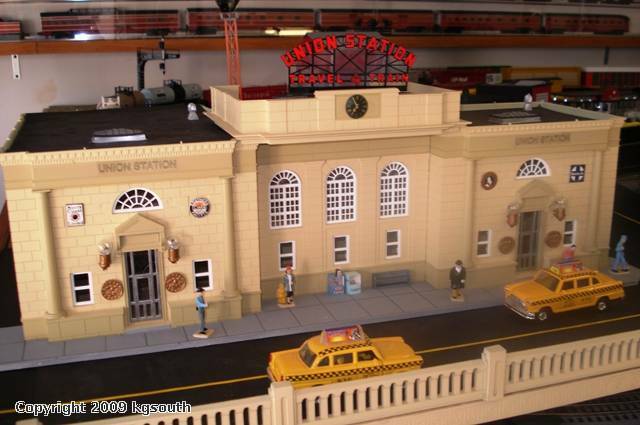 Also, did you repaint the station, or were the banks that cream color to begin with?